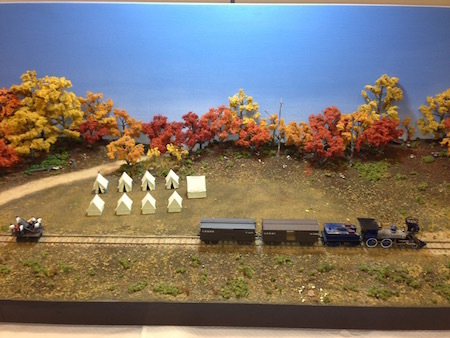 Picture taken at the NMRA Convention in Atlanta depicting the USMRR serving one of the Union Army camps. (Modeler unknown). During a recent trip to Appomattox, Virginia, during which we had the opportunity to see the Civil War Museum and other areas of interest there, I became inspired by the remarkable history of the war and especially the key role that trains played in that war and many others before and after. The American railroads were first introduced to war during the Mexican-American War in 1846 and were used primarily to transport soldiers. 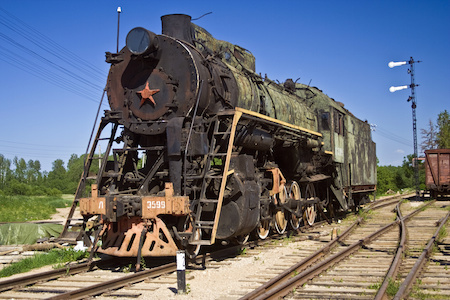 In Europe around 1855, the British built a railroad (The Grand Crimean Central Railway) to transport supplies and to return the injured during the Crimean War. In 1858, the railroad was used to rapidly move soldiers to support the Italians in their War of Independence from the Austrians. Shortly thereafter, the railroads were used during the Civil War in America (1861-1865) not just to transport soldiers and supplies, but were also used in a major way for strategic military planning and operations. Almost every battle fought in the Civil War was within 20 miles of either a railroad or a river in order to facilitate rapid transportation of troops and equipment. In the North, there already existed a large network of railroads from the East to the West compared to the South’s one meager line composed of several separate railroads with differing gauges, giving the North a major advantage in moving troops and supplies. Also in the South the railroads were mostly private or state-operated such that they were not as unified as the rail system in the North where industries cooperated fully with the Federal government. Related to this is the fact that Congress created the USMRR (United States Military Railroad) in 1862 which was dedicated to the military effort. Herman Haupt, the commander of the USMRR, was able to accomplish feats that amazed President Lincoln, such as building a 400-foot bridge over the Potomac Creek in less than a week. He was also an expert in combining the use of water and rail lines to support the military effort, involving the use of railroad float barges which he designed. Each barge contained eight tracks which carried eight cars. Two of these barges would carry a total of 16 cars which consisted of one train. One of the major wartime railroads used by the Confederacy was the first class Western and Atlantic Railroad, which was eventually destroyed in the war. The General, a 4-4-0 steam locomotive, built in 1855, was one of the more famous engines that ran on that line. The W&A was also the site of the famous Great Locomotive Chase in 1862, when Union soldiers in civilian clothing infiltrated the Confederate troops and tried to destroy the railroad but failed. The Cracker Line was one of the Union’s main wartime-railroad supply routes extending from Bridgeport to Chattanooga, crossing the Raccoon Mountains through Cummings Gap and using Brown’s Ferry and Kelly’s Ferry along the way. The Confederate General Bragg was able to disable this railroad for the most part for a while, which limited supplies to the Union troops. However, the W&A which was the Confederate’s only supply line was declining at about the same time. When Grant took command of the Union army in 1863, one of the first and most important things he did was to shore up the supply lines using the Cracker Line, ferries and barges. The southern W&A was severely declining due to mismanagement and need for repairs, while the Union Army, commanded by General Sherman, was advancing on Atlanta. The Confederate Commander, Joe Johnson, trying to defend Atlanta, lamented that if the W&A could not be improved, his cause would be lost. He sent many messages about this to his superiors, but his requests were not answered and Atlanta fell to the much better supplied Union soldiers. Interestingly, the final blow to the Lee’s Confederate Army was that the only supply train that was moving to restore supplies to his starving troops after a rough winter, was captured by the Union soldiers just before it arrived at Appomattox where his troops were gathering. Shortly thereafter, Lee surrendered, his troops turned in their weapons and, due to the lenient terms of surrender as ordered by President Lincoln, the Confederate soldiers were permitted to return home to their farms and businesses. McLean House where Lee surrendered to Grant - The last Confederate W&A supply train was captured by the Union Army near this area. So, as you might imagine, the history of trains in the Civil War lends itself to lots of ideas and opportunities for model railroaders to create a variety of Civil War scenes and operating railroads depicting the era. The Chattanooga Depot with the Lookout Mountain behind was frequently used for military trains coming and going delivering soldiers and supplies. 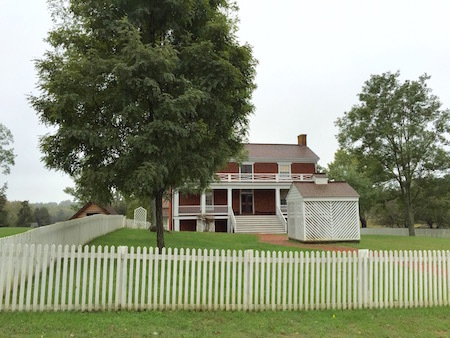 A scene at Appomattox showing the capture of the Confederate train, or the soldiers turning in their arms as Lee meets Grant at the McLean House for the signing of the terms of surrender could be shown on a layout. Models of armored trains and railcars with cannons (including the famed Lee-Brooke gun and the Dictator) would be interesting projects for scratch-building. The busy Chattanooga Depot and surrounding area could add a lot of operational opportunities. A layout depicting either the W&A or the Cracker Line, or both, depending on your interest and ambition, containing some of the above scenes, could be used as general themes. One good thing about modeling the Civil War railroads and other more modern railroads in wartime since then, is that it would be easy to research since so much has been written about them. Many good references are readily available on the Internet or at the local library. To get you started, I would look at the book entitled Model Railroads Go to War, written by Bernard Kempinski. This book not only describes the history of several wartime railroads, including maps and sample layouts involving the Civil War (USMRR Aquia Line, McCook’s Landing, Cracker Line), but also goes into the use of railroads in WWI, especially at the Battle of Cambrai, and in WWII, detailing America’s railroads (including the Brooklyn Army Terminal) used at the time for military purposes. In addition, it shows how wartime railroads were involved in re-capturing and rebuilding the Cherbourg Harbor in Normandy. There is even a section on military railroad buildup and use in the Cold War, modeling a modern military train and an example of a model railroad layout supporting Fort Hood in Texas. The last chapter shows information about the space shuttle era and the NASA Railroad at the Kennedy Space Center including a suggested 10’ x12’ N-scale rendition. Many, many opportunities for railroad modeling and operations exist using the theme of railroads-in-wartime. 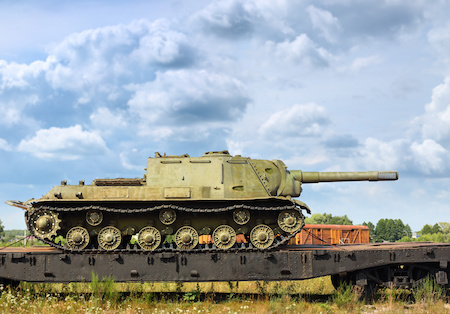 Military railroads immediately have a purpose of moving troops, guns, equipment, food, medical supplies, uniforms, etc. back and forth from city to city, from manufacturers and industries to depots and military camps, and so on. So you don't really have to think up a purpose. Just choose your era, research it a little, pick what scenes you want to model, draw up your plans and you're ready to go.